Have you checked your Mass Market book price on Amazon? If you haven’t, perhaps you should, because you might be in for a surprise. There are some crazy book prices on Amazon. Selling used books on Amazon is not new. It works in a similar fashion to your local secondhand bookstore or thrift stores. Except, in this case, people who have used books to sell look for book buyers on Amazon. First, they need to open an Amazon account and then a seller account to be able to sell books on Amazon. Then, choose between the two ways that used books can be sold on Amazon through Seller Central. 1. Amazon FBA ( fulfilled by Amazon ) means that the books are shipped to an Amazon fulfillment center before the customer orders them. When the customer places an order, Amazon packs the book and ships it. 2. Amazon FBM ( fulfilled by the merchant ) means that when a customer orders a book, the Amazon seller packs and ships the book and pays the shipping costs. It all sounds quite reasonable and fair, but of course, the authors and publishers are not entitled to any royalties because the books are secondhand. To get an idea of how people make money from used books, this article by The Work At Home Wife explains how Amazon fulfilment works. For an out of print book, all is fine and fair. One of my very early books, which was withdrawn from sale and later completely re-written, edited and re-published under a new title is still available on Amazon as a used book. As you can see, it is not listed or available in any other form because it is out of print. As far as the price is concerned, it is quite reasonable and seemingly legitimate in the first listing, but then the next two are ridiculous. Well, except for those readers who are devilishly inquisitive and want to read a book that was full of errors and bad writing. Yes, I made some awful mistakes when I first started self-publishing. 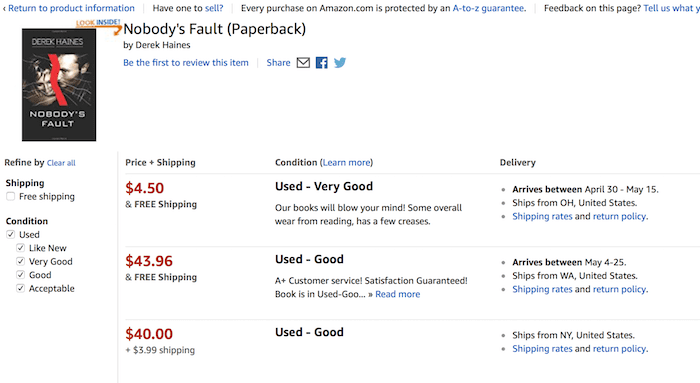 This is how selling used books works on Amazon, and apart from the two inflated prices, there is no reason for concern. For new authors, however, it is a reminder that if you self-publish in paperback or hardcover, your book can never be totally removed from sale as is the case with ebooks. Anyone who has copies of your out of print book is legally able to sell books on Amazon. However, the fly in the ointment is when these used books are listed on Amazon on the very same sales page as the book being sold by a self-publisher, small press or publisher. If you are new to self-publishing and selling books online, there are sometimes some nasty surprises in store. Ebook piracy, illegal pdf copying, fake and nasty book reviews as well as all manner of scams can and do affect electronically published books and ebooks. Used book selling on Amazon, which is sometimes called flipping books, is yet another scam that seemed to have started with selling used textbooks. Now, however, these scammers can be seen at work on any type of book. One of my titles now has a Mass Market Paperback listing on its page on Amazon. As you can see in the image below, the price is, to say the least, surprising. If you can’t read the image, the seller has set the price at $2,796.00! There is no way this price is a legitimate offer, but I clicked and checked the details of the offer, and here is what it shows. Well, it reassuring to know that the used copy of my book is in good condition. But at this absolutely stupid price, you would think that this scammer could at least offer free shipping. So why would anyone create a listing for this used book at such a crazy price? The only logic I can see is that this Amazon reseller is preying on someone inattentively or accidentally clicking on the buy with one click button. I suppose accidents do happen. I presume this seller is using Amazon FBM, so if someone stupidly buys the book at this price, the seller quickly buys a new copy of my book for $13.95 and then ships it to the buyer. For the inattentive buyer, the first step would be to contact customer service about how to get a refund. But when you take a look at the refund policy of the individual seller, you can see how the money is made. Please refer to the Amazon.com Return Policy or contact G******Books to get information about any additional policies that may apply. Request authorization from the seller? Now I think I know exactly what the answer would be. It could take a long while for a buyer’s credit card transaction to be reversed, if ever. 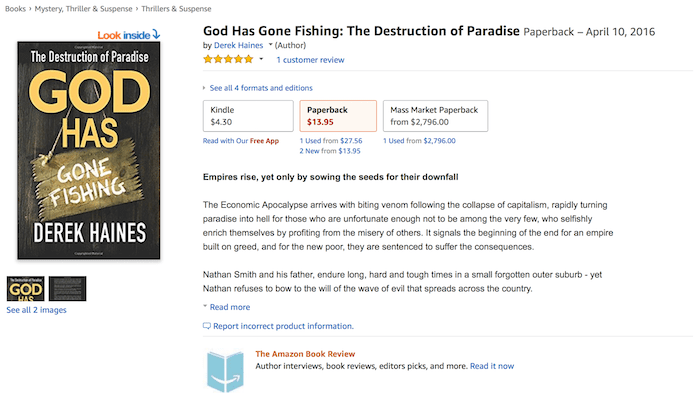 What can you do about used or mass market copies of your books on Amazon? The answer is simple. There is nothing at all that you can do about it.. The business of selling used or secondhand books has been in existence ever since books were first printed. When a used book is sold, there are no rights or royalties payable or due to authors and publishers. This has been accepted practice for almost ever and for as long as local secondhand bookstores have been part of the literary landscape. Royalties are only payable on the sale of a new copy of a book, and in this respect, Amazon, like any other retailer abides by the law. Simply because Amazon has replicated the secondhand bookstore model on its site with used books online, does not mean Amazon is scamming or ripping off authors. However, whenever and wherever there is money to be made to top up a bank account, it will attract unscrupulous people. The only hope is that Amazon takes a firm line with its sellers who are unfairly profiteering, but it is a fine legal line. Selling a used book at any price is not illegal. If you are a small press or self-published author, all you can do is worry about what you can control. Make sure your book is as perfect as it can be, attractive to book buyers and priced competitively. Then promote your book as widely as you possibly can to maximise on your book sales potential. There will always be sharks, scammers, crooks and schemers on Amazon and the Internet, but spending your time worrying about them is a waste of time. Am I worried about my book being offered at $2,796.00? No. But I did waste five minutes of my time laughing about it. Further reading: What Are The Best Ways To Sell Books Online? I fail to see what all the screaming is about. Second-hand shops are a fact of life, and I routinely stretch my book-buying budget at used-book shops, and by borrowing at my public library. I do buy new books when I can afford them. Thanks for your comment, Christine. I wouldn’t say I was screaming. But I thought it was worth alerting new authors to what goes on with their books on Amazon. As I showed in my two examples, there are reasonable resellers, and clearly, some scammers. My only hope is that Amazon takes action against these scammers as they have done with paid and fake reviews. Not an easy job, but Amazon does have the tools when it deems fit, to use them. I had this happen to my paperback book. In fact, the used book was listed prior to my book listed through CreateSpace. I was assured by Amazon the ad was a legitimate seller and further assured for this seller they had to purchase it through Amazon first and I would get my royalties. The ad a few days later was linked to my product page appearing that the buyer had the option to purchase from more than one site. In addition, this listing was a price almost double for my selling price. Weird, thank goodness two weeks later, it was taken down. Thanks for sharing your experience, Chuck. But Amazon’s assurance of ‘legitimate seller’ is not easy to define. Legitimate scammer, perhaps? Glad to hear that your problem disappeared quickly though. I desperately needed an item one time and settled to buy the overpriced listing on eBay, but the seller contacted me and said the item was out of stock and they were sorry. I asked why it was listed and why I was able to purchase it, and they replied that they just put an exorbitant price tag on it when they are out of stock until they restocked because it’s easier than relisting the item. Perhaps that’s the case with your book in that particular seller. Regardless, though, it’s capitalism at work… Buy it cheap; sell it for more. Happened to me and still happening. I laugh. Stuff happens! Anyone who would buy a book at those prices, unless it’s a rare antique, deserve all they get. What did concern me was when I saw a copy of one of my books on sale at an inflated price when I hadn’t yet sold a copy. For the person who commented and said you were screaming (which you weren’t) and that it is no big deal to sell used books this way, I disagree. It is really discouraging to offer a book for a low price because you don’t believe in gouging people and then see that someone left you a 1 star rating because they felt unhappy with paying 80$ (for something I offer for 8 dollars) and wants a refund….asking in their rating if you will give it to them. So, I wish there was a way to block people from being able to list your book as “used” and to ask for more than the new listing price. As for why people buy from those sources, I think sometimes it has to do with whether the book can be shipped from amazon to other countries. So, people who can’t get the book through the normal amazon channels start looking at the use or more expensive sources??? Not sure though. I don’t fully understand the economics of the scam, but I know it’s a scam of some sort. And Amazon allows it to flourish. The author is powerless to do anything about it. An old edition of one of my books showed up as “used” by three sellers who appear to all be the same guy. I sent him an email explaining his selling of an older version of my books was confusing my customers and asked him to please remove it for sale. Instead he raised the price. As I said – I don’t fully understand the economics of the scam, but I know it’s a scam. Hi, I recently opened an Abe book shop to sell a library of books I inherited from my mother when she died. They are all philosophy books and history some quite obscure. I have been pricing them one by one using Abe and Amazon and sometimes eBay , as I want them to sell I usually undercut the lowest price by a few pounds. I noticed there were several book shops listing used books at ridiculous prices, all the shops are in the US and it is often the same shops that pop up each time with books listed at thousands of dollars. Definitely a scam , not sure if it is to inflate the value of their inventory or some kind of money laundering ( not sure how that works with books priced at $2,000) or like you said to catch someone unawares, but someone ie Amazon should look into why they are doing this. Disclosure: I’m a used bookseller on Amazon. I don’t see any scams here. This is simply a misunderstanding (or an an overreaction). Many customers are perfectly happy with buying a used book. Amazon is also happy to supply it, as they get a 15% + cut out of every book sell. I’m sorry if you feel this is at the detriment of your “new” copy sells. But your right to sell new books does not trump a customer’s right to buy used ones, nor Amazon’s or my right to provide that service. It’s a rather entitled sentiment to expect Amazon to provide your version of a “perfect’ author page for you, featuring no used offers. It’s a large business and they’ll do what’s best for them in the long run. Frankly, you should be happy to make ANY sell, even if you don’t profit directly off used book sells. Your name is getting out there and if you are a writer worth your salt, the next gift that customer receives might be your entire bibliography purchased “new”, direct from you, for Christmas. Are there scam sellers? Yes, sometimes. Trust that Amazon enforces this aggressively, even getting innocent 3rd party sellers caught in their wide net at times. But your opinion of what is “overpriced” is simply that, an opinion (not a scam). In the U.S. we are lucky to have a free market. Customers are allowed to determine what a fair price is (not you, I, or Amazon) through their buying power. The absurd $1,000+ price tags are most likely an issue with imperfect auto-pricing software. A seller with many thousands of items in their inventory can’t manually alter every item’s price to match market conditions. It’s not something to worry about. I strongly doubt anybody has ever paid that price for your book. If they have, and it was a mistake, Amazon will expeditiously refund the customer for any reason, despite the 3rd party seller’s preferences. Amazon 100% has the customer’s back, to a fault usually. The customer can complain about a piece of lint or that they were offended by your book and much of the time they can get a full refund without ever returning the item. My turn to complain: The rate of fraudulent customer returns is very high, especially in electronics. I’ve had the wrong items returned. I’ve had electronics that were swapped with broken ones and returned or purposely broken by a customer that thought that was what they needed to do to claim a refund (Hint: please just send your original items back in the original condition. That’s all us sellers want. Amazon may tolerate buyer fraud, but I’ll be quick to report you to several authorities). This is how Amazon chooses to run their business. They are “buyer first” in their thinking and that’s their right. It’s my decision to continue to incorporate scammy buyers into my business risks. And there are FAR more scammy scummy entitled buyers than sellers on Amazon. The reason I mention all this: $40 (or any price for that matter) is a perfectly reasonable request for your out-of-stock used book. As a Prime seller (this means Amazon warehouses my books), I usually have to sell a book for $10+ to break even after Amazon’s fees. If I have a free book that I sell for $11, I’m only going to make about $1 after expenses. This sounds crazy, but it’s true. Factor other fees, shipping, returns, my time, etc, I can’t profit selling a book for anything less. Can I sell your book for $40? Probably not, but if it meets the proper demand and supply metrics, I might try to. Thriftbooks (an Amazon megaseller) might be able to profit off a $6 book. But they have negotiated shipping rates and possibly better rates with Amazon. They also have many employees and premium technology that can facilitate automation. It may also be easier for them to break even on an item or take a small loss than to dispose it. Bottom line: your concerns are mostly moot. As to real scams: There are counterfeits that slip through the cracks at Amazon, but this problem mostly affects high priced textbooks and similar items. Amazon and the publishers police this very very aggressively with stings. Also, Amazon blocks the sell of many “high risk” books for new sellers unless they can jump through a lot of hoops showing that they purchase direct with invoices. And if, perchance, I accidentally acquire a counterfeit that looks very convincing and if I mistakenly sell it during one of their stings, I’m likely a goner. Amazon will toss a long term responsible seller for one mistake with a counterfeit item. This is a fact and you can browse Amazon seller forum to see some very real fear in our community. This is a reality that I have to deal with as my Amazon income can disappear any day. So yeah, us 3rd party sellers hate counterfeiters too. There are also many drop-shippers which can account for some of the inflated prices, but likely not $1000+ ones. While I’m not a drop-shipper, I support someone’s right to do so. However, when I see poor feedback due to multiple late and canceled shipments, I wish that Amazon would hold them more accountable. But, again, that’s Amazon’s decision (not mine). A savvy customer will investigate 90%+ feedback sellers to ensure they aren’t a drop-shipper. Customers should take more responsibility, but again, that’s not my call. Another real issue is sellers sending out the wrong edition or grading their items very poorly. But, I hope, this will hurt their feed back and lose them buyers. Believe it or not, Amazon can be guilty of this sometimes even with their direct sales. Sorry for the spiel, but you struck a sour note with me. Your rights as a writer are not any more important than someone that run’s a bookselling business to support their family. There’s some real irony in the fact that you think so. Your attitude, when writing this article was entitled and uniformed. I hope you’ve changed your views since than. I would really like to hear from either Ryan Crenshaw or Derek on my following question. I haven’t sold nearly the number of paperbacks being offered by 3rd-party sellers on one of my novels (I haven’t sold ANY in YEARS). My DH says their model is probably to wait for an order, then buy a paperback from Amazon (it’s KDP Print, so I’d get a royalty from it), then turn around and ship it to the customer, thus allowing both me and the seller to make a few dollars from one sale. HOWEVER, my understanding of “mass market paperback” is the size. Well, back when I arranged for POD (from CreateSpace at the time), I sized the print books a bit larger than the “mass market paperback.” So it seems to me that if someone is trying to sell a Mass Market Paperback of my book, then they have pirated my content and are creating their own print books. Is this true, or am I just being paranoid? If the latter, then what the HECK does Amazon mean by “Mass Market Paperback”? Because there are supposedly sellers selling my print novel “used” and “new” underneath the plain-old “Paperback” button with the amazon prime symbol. So why the distinction? Thank you so much! I’ve been really upset about this for a few days. The screaming happens when you sold only seven new book copies while people selling thousands of used copies of your book on amazon!!!!!!!!!!!!!!!!!!!!!!!!!!!!!! The screaming is about those other sellers who sell replica of your book and don’t order it from amazon and the author never gets paid! I self-published my book only a few days ago. I just happened to check on Amazon, to see whether it had found its way onto Amazon yet. (I used an independent self-publishing website, instead of Amazon’s Create Space website.) I was surprised to find that already someone is selling the book as new for almost £4 less than my RRP and the same seller is offering at used. How they’re able to do this beats me. But if it’s going to affect my book royalties, then I am concerned. It is always a nasty surprise for new authors, Jae-lex. But if you refer to the long comment by Ryan earlier, he explains how Amazon book resellers operate. But it beats me how they can offer your book at a lower price. When you devote your life to seeking wisdom and learning the skill of writing, and you finally bring your end results to the book market, it is exasperating, aggravating, and insulting to see more used copies than you have sold new — in “very good” or “like new” condition. As to future sales of future works based on rip offs of my current work, that’s like thanking a pick-pocket for making you aware that you did have some cash in your wallet. No author would agree to the comments of the seller on this page.